News just in from Marco Vandoni at Ocean Independence that he's now listed the 53.4m motor yacht Tales for sale. She was built by Proteksan to ABS class in 1999 and refitted in 2012. MCA compliant, Tales accommodates 12 guests in six staterooms and twin Caterpillar engines give her a cruising speed of 12.5 knots and a range of 4,500 nautical miles at 11 knots. 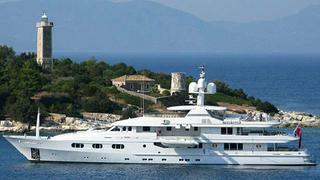 Lying in Genoa, Tales is asking $22 million.